Summary The headquarters of the Insolvency Service are situated in a terraced building in Bloomsbury Street, London. The building also contains Companies House and the training arm of the DTI. The building was originally constructed in the late 19th century and in 1988 was extensively rebuilt, whilst maintaining the original Victorian façade. The building consists of seven floors, five of which were built around a central atrium. The glass of the atrium roof had been covered with a micro-fabric mesh to reduce heat gains and direct sunlight into the atrium itself and the offices surrounding the atrium. 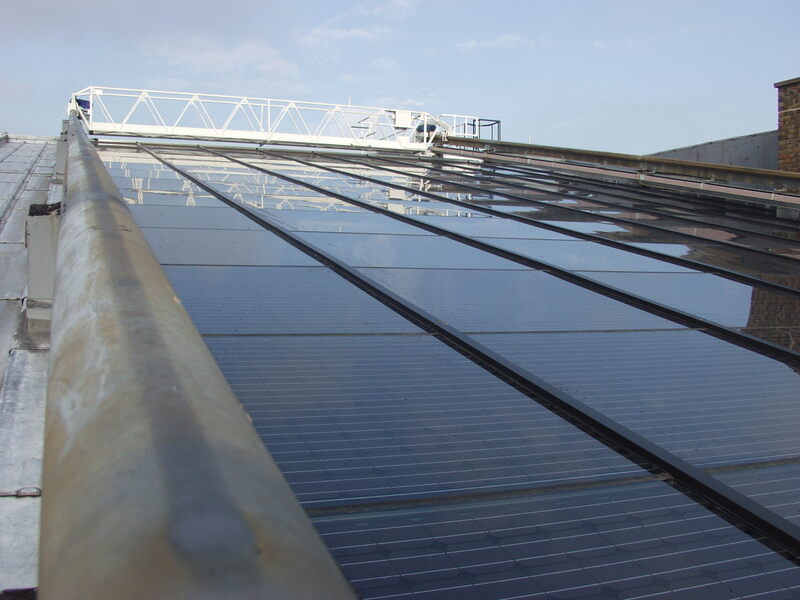 This function is now being performed by the semi-transparent 25.4 kWp PV glazing system, which was installed during 2003, replacing the original atrium glazing. The PV system operates in parallel with the distribution network. On the north-eastern side of the array is a vertical wall, which causes some shading during the early part of the day. Additional shading is caused by the rails of the gantry, which is used for access and cleaning. When not in operation, the gantry is parked at the top of the roof where it does not cause any shading of the PV array.